Last week, Spotify rolled out the beta version of its newly revamped Spotify Radio app, which takes direct aim at Pandora Radio. 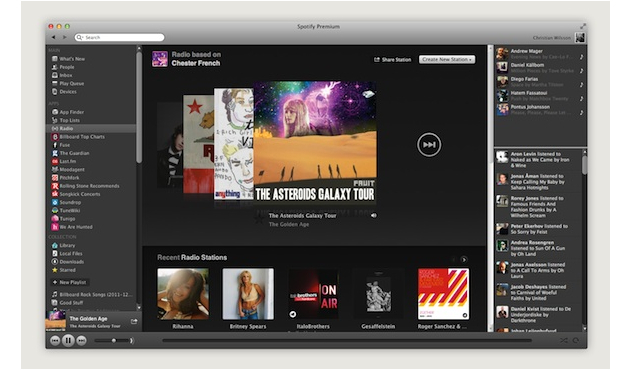 And today, the new Spotify Radio officially rolls out to all users. While many — including yours truly — focused on Spotify’s unlimited skips and unlimited stations features as the primary trump cards over Pandora, which limits free users to 12 skips per day, and 100 stations, we’ve now learned that Spotify Radio has a secret weapon. It’s called Echo Nest, an algorithm-based music recommendation engine used to deliver each new track on your Spotify Radio playlist. And it could very well be Pandora’s worst nightmare. Like the much-talked-about Music Genome Project that powers Pandora, Echo Nest uses deep song analysis to pick which song to play next. Here’s where the two engines differ: Pandora has skilled musicians — actual people, not computers — who go through each and every song to catalog more than 400 specific musical traits. Those details, along with user input (i.e. thumbs up or thumbs down) are then used to determine which song plays next for each individual user. Echo Nest, on the other hand, relies heavily on computer analysis — things like “signal processing” and “machine listening” — to extract and record the determinant musical attributes. By sifting through mountains of data on each artist, Echo Nest also adds factors like “hottness” of a song (it’s mainstream popularity), and geographic location (whether an artist is from a place near a certain user), to help craft Radio playlists for each user. Echo Nest is slowly putting each of Spotify’s more than 15 million songs through its API, so you won’t necessarily see the benefits of its deep analysis for every track just yet. And the only way to know whether a song has been Echo Nest-ified is that a small Echo Nest logo appears next to the album artwork when a new song starts in Spotify Radio, but only for four seconds. When we compared Spotify Radio and Pandora last week, our biggest complaint was that the tracks Spotify chose to play were not quite as perfectly selected as Pandora’s selection. If Echo Nest is all it claims to be, it seems Pandora’s edge in curation may quickly dull. So, which is better, man or machine?